It’s National School Choice Week 2017! All week the SEA Homeschoolers has been sharing their School Choice Week Podcast series. Today is my interview with Mari Buckroth, in which we discussed secular homeschooling with Charlotte Mason and living books. Have you been wondering how to secularize the Charlotte Mason philosophy? How to make time in your busy schedule to read aloud to your children? How to choose living books or getting it all to work with reluctant readers? We chatted about all of that and more! 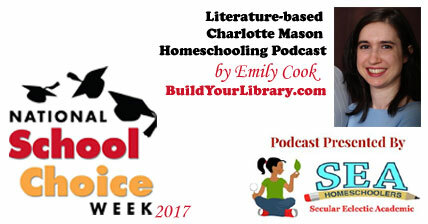 Listen to my Literature-Based Charlotte Mason Homeschooling podcast here!